Think Londoners and New Yorkers have it bad when it comes to sky-high house prices? Residents of Oslo have reason to gripe, too. House prices in the Norwegian capital are among the world’s highest, as measured by the average cost of a home relative to household median income. Prices in Oslo are perhaps the most visible symptom of a real estate boom across the oil-rich, Nordic nation of 5.2 million people. Nationwide, the cost of a home relative to income has almost doubled since the mid-1990s. 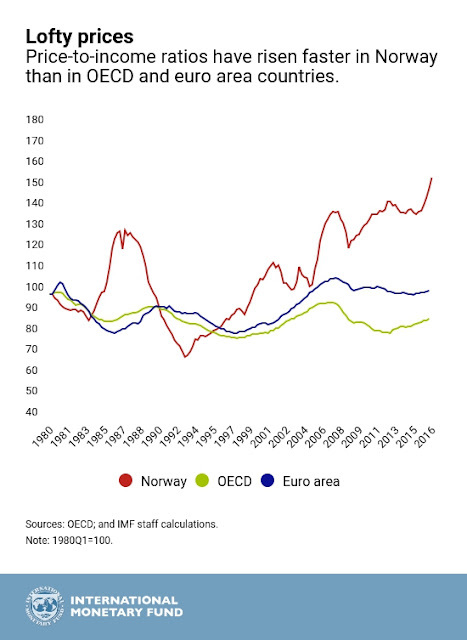 Strong demand for housing in Norway has been driven by growing incomes, the rising number of households relative to housing supply, low interest rates, and generous tax incentives for home ownership. Our Chart of the Week shows the evolution of Norway’s house price-to-income ratio compared with that in the 35 countries of the Organization for Economic Cooperation and Development, the Paris-based group of advanced economies, and euro area countries. As house prices have risen, so has household debt, which—as measured in percent of disposable income―has reached historic levels and is among the highest in the OECD. All of this raises the risk that a large correction in house prices—driven for example by slower real income growth, a reverse in sentiment, or interest rate hikes―could weaken household finances and depress private demand, which could in turn hurt corporate and bank earnings. That’s among the messages of Norway: Selected Issues, a paper published by the IMF on July 5 in conjunction with the annual checkup, known as an Article IV Consultation. The Norwegian authorities have already taken important steps to protect the economy from the impact of a potential housing bust, such as requiring banks to hold more capital and introducing tighter mortgage regulations. In particular, some early signs of softening in housing market conditions emerged recently following the introduction at the beginning of this year of a debt-to-income limit on new mortgages—in line with IMF’s past advice. But more may be needed if vulnerabilities in the housing sector intensify. Options could include tighter limits on loan-to-value ratios, higher mortgage risk weights, and reducing the scope for banks to deviate from mortgage regulations. In the longer term, the ability of the financial sector and the economy more broadly to withstand housing market shocks should be strengthened through reforms like reducing tax preferences for housing, relaxing constraints on new property construction, and developing the rental market to provide more alternatives to home ownership.